This lovely one bedroom unit, located in the Royal Kahana Resort has beautiful sweeping views across the water including the islands of Lanai and Molokai. You can enjoy the water view and spectacular sunsets from the lania, living room and bedroom. 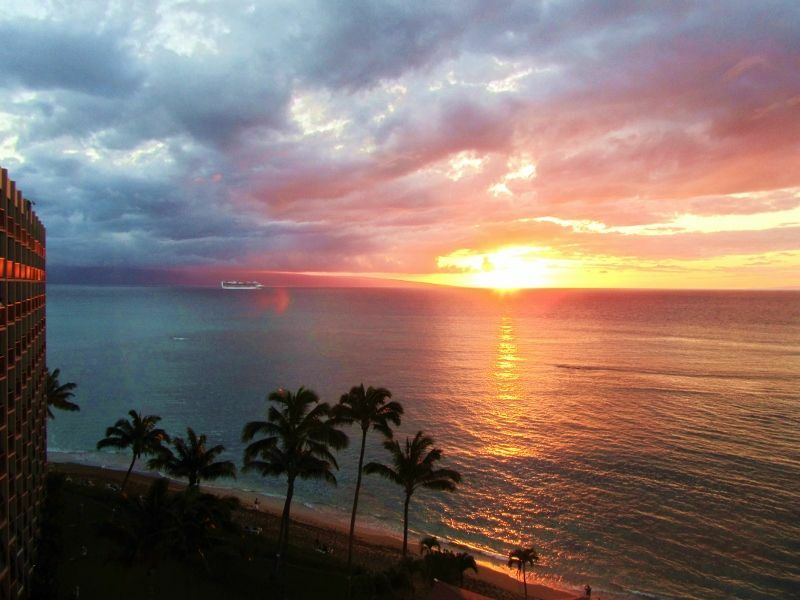 The Royal Kahana is centrally located between the Kaanapali and Kapalua resorts, in the quiet community of Kahana. Royal Kahana's ideal location means that guests are within minutes of all of the activities that make Maui the #1 vacation destination in the world. NOTE: We do not advertise on Craigslist.org., or any other vacation rental site. Our condo is only listed for rent on VRBO. Do not pay for a reservation with a bank check on these sites. Please be advised this unit is not ADA compliant. It is upgraded with granite countertops. Linens provided, along with beach chairs, beach mats, and beach towels. This was our first time using VRBO and it was a great experience. The property was "As Advertised". Neat and clean and well cared for. Loved having a washer and dryer. The pool area was clean and quite. Plenty of shade for us non-sun worshipers. In a great location to other attractions. We will stay there again when we are back in Maui. This condo was exactly how it was described on VRBO, the owners provided all the little extras you could think of too, My husband and I really enjoyed the beautiful view also, we would most definitely stay here again! We had a great time in Maui. We absolutely loved having coffee on the balcony in the morning and a glass of wine to watch the sunset. Royal Kahana is not a newer building and some areas do show its age. However, this unit was very much as advertised. We found the unit to be exceptionally clean with newer flooring, and very comfy beds. The pool and grills are very well maintained and clean. Our only issue was with the air conditioning. It was around 90 degrees each day we were there and we could only get the a/c to cool to about 10 degrees cooler than outside. The coolest it ever got in the condo was 75 and that was in the wee hours of the morning. Cheri was great and responded to my concerns in a very timely manner. We live in Seattle and aren’t used to the heat so it was very difficult for us to sleep. Closing all the interior doors of the condo and running the ceiling fan in the bedroom did help some. We would definitely stay here again but perhaps in cooler months. Mahalo! It was great!! 5 stars!! The condo was wonderful! It had everything that was needed and most of all a great view of the ocean!!! Nice views and a great spot on maui. Was close to everything on the west side of the island and had a great view! The place was amazing and had everything we needed. We absolutely loved our stay at the Royal Kahana! The sunsets from our balcony were the most beautiful I have ever seen. We had everything in the condo we needed to make our stay comfortable and the boogie boards, chairs and umbrella were a huge plus. We can’t wait to come again!! Mahalo!! There are both fine and casual dinning restaurants, a gas station, a convenience store, sundry shops, coffee shop, bank, and clothing shops are all within a two-minute walk from your luxury accommodations. Championship golf at both the Kapalua Golf Course (home of the annual SBS PGA Tour Championship and the Royal Kaanapali Golf Club (home of the annual PGA Senior Skins Game) are just minutes away, as are beach activities like parasailing, jet sking, snorkeling, stand up paddle boarding, surfing and sailing.